A new pastry restaurant has opened up on Driver Street. Helmed by an award winning owner and a trained staff, this new shop aims to provide the neighborhood with a space where neighbors could meet, grab coffee, and hang out. Enter Ali Rudel and Ben Filippo. When expecting their first child, the couple moved to North Carolina from New York seven years ago. 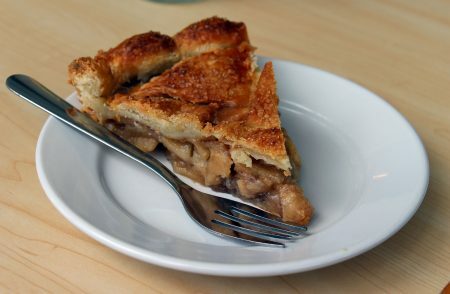 According their website, the East Durham Bake Shop collaborates with producers and farmers in Durham and the Triangle. Both Rudel and Filippo had prior experience in baking and cooking. Filippo used to teach cooking to kids in South Brooklyn while Rudel previously worked as a farmer’s market manager and baker. Rudel feels the high volume bakery she worked at in New York prepared her for this shop. “It was a unique experience in that I was there from the very beginning, as they were starting up. So, I feel in addition to getting baking experience, in that situation, I also got start-up business experience.” Rudel says seeing that business grow from the ground up inspired her. Originally, the shop was called the East Durham Pie Company and it was a solely operated business that delivered pies to shops. Since then, the company won “Best Pie in Durham County” in Indy Week’s Best in the Triangle -Eat and Drink category for 2017. This was before Rudel even had a brick and mortar space, so getting that kind of support made her feel like she was moving in the right direction. Rudel says she attended a community listening meeting where people talked about what they were interested in seeing, one being a coffee shop. “They definitely wanted a place to be able to sit and eat in,” Rudel said. Owning a business was a huge transition for her. Rudel mentioned the support she’s gotten from a local women’s business group named WE Collective. Filippo praised his wife’s work and cites her as the one who taught him how to bake for the restaurant. “I’m really sort of like the appendage to her. It’s all her thing,” he said. For Rudel, the work days begin as early as 3:30 a.m.
Filippo likes the joy baking brings people. “That’s like the most rewarding thing ever. When people are just excited and smiling with each other and eating your baked goods. Rudel describes baking as a combination of all the good nerdy things. “It’s artistic, it’s very creative but it’s also very rules oriented. There’s a lot of math involved,” Rudel explained. “It’s sort of like, you’re given this very specific canvas with all these rules and you can do whatever you want within it. You can break the rules, but you do so very carefully,” she said, laughing. The East Durham Bake Shop officially opened on Wednesday March 21. On Tuesday, there was a soft opening for Kickstarter supporters and people in the neighborhood. Rudel says there was really positive feedback. “It was really awesome to look over at one point and see two of my neighbors sitting and having coffee, and I yelled at them. I was like, ‘You’re doing the thing that I hoped would happen!’”. 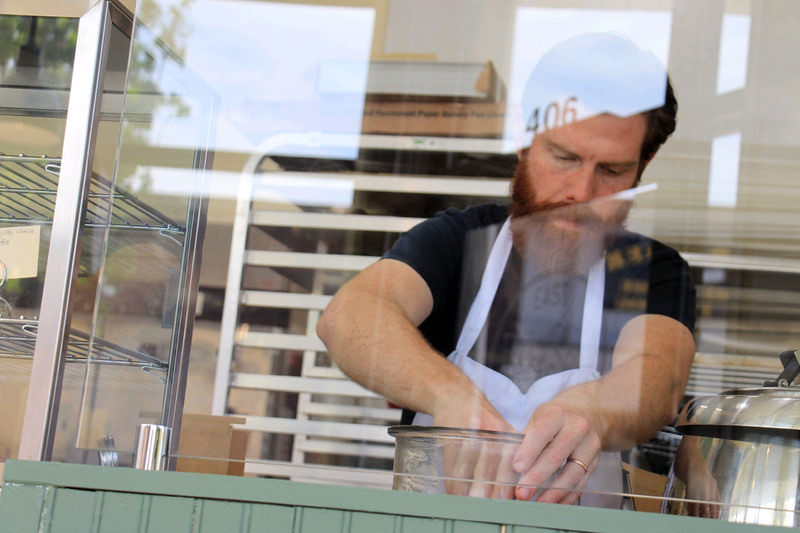 Social Media has played a part in the Bake Shop’s success. Pictures of people eating and enjoying the shop are all over their Facebook and Instagram pages. There’s even a photo of a surprise visit from Mayor Steve Schewel. Filippo described running the Kickstarter for the shop as a full time job of its own. “Keeping up with it, and promoting it, promoting it, promoting it and sending an E-mail to everyone I ever met,” Filippo said. “I felt like the Don King of Kickstarter at one point. I’m just hype man all the time and Ali was the manager of it, and I was just out there telling everyone about it. As for long term goals, Rudel and Filippo are both just interested in the present. “For me it’s just about seeing what direction it goes in, what customer demand is, what people are excited about, what people are not excited about,” Rudel said. “For me I can visualize what I think people might want, but at the end of the day, it’s about what they want”. For more information visit eastdurhambakeshop.com, like their Facebook page of the same name and follow them on Twitter @EDurhamBakeShop. Corin Hemphill of Charlotte is a senior journalism major at NCCU serving this spring as a staff writer-photographer for the Durham VOICE.